Spiceworks is a popular and busy community-driven Web site for IT professionals to share ideas, best practices and recommendations on products and services with their fellow “Spiceheads”. 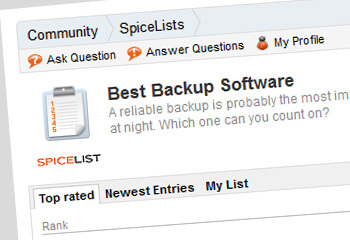 A feature of the community are the Spicelists, where members rank their favourite products in different categories – one of which being backup software. Of course we do have a slight bias towards BackupAssist but regardless of the product you choose , if you haven’t yet shown a little love for your favourite, we’d really appreciate you getting involved. Vote for your favourite backup product here.